Inclusion does not suggest rarity or value and we are unable to offer more information, identifications or valuations. Archive items are not for sale and to buy china please visit our Home Page or click on Buy Similar Now. Click on the small picture below for a larger photograph. With gilt. Oh great joy, a tile is such a rarity in Real Old Willow. No backstamp. Light crazing, the surface has a little minor scratching and there is a small nick to the rim of the face. There are a few glazing blemishes around the side and a few minor chips to the underside rim. On the back there is a small firing crack, overall remarkably unscathed for a tile. Backstamp: H & E Smith Made in England (tile makers for Burleigh). A little minor surface scratching and a tiny manufacturing chip to one corner which has been glazed otherwise excellent condition. Made by Malkin Edge & Co, Newport Pottery, Burslem. Fabulous tile with a touch of crazing and a little damage on the back and side otherwise excellent condition. One of a series of tiles, designed by William Wise (1847-1889) for Minton. 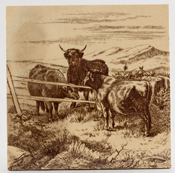 This tile features Highland Cattle and is printed in black. Backstamp: Mintons China Works Stoke on Trent Mintons Stoke Upon Trent Walbrook London. A touch of crazing with small chips to the corners and a couple of small chips and pitting to the rest of the rim. One of a series of tiles, designed by William Wise (1847-1889) for Minton. 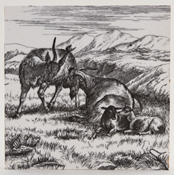 This tile features mountain goats and is printed in black. Backstamp: Mintons China Works Stoke on Trent Mintons Stoke Upon Trent Walbrook London. Small chip to two corners and a little minor pitting to the rim. One of a series of tiles, designed by William Wise (1847-1889) for Minton. This tile features cattle, is signed on the front W Wise 1875 and is printed in black. Backstamp: Mintons China Works Stoke on Trent Mintons Stoke Upon Trent Walbrook London. Light crazing with some pitting to the rim. One of a series of tiles, designed by William Wise (1847-1889) for Minton. 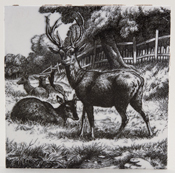 This tile features deer and is printed in black. Backstamp: Mintons China Works Stoke on Trent Mintons Stoke Upon Trent Walbrook London. A little light crazing with just a touch of pitting to the rim. A little excess cement around the outside, overall excellent condition. One of a series of tiles, designed by William Wise (1847-1889) for Minton. 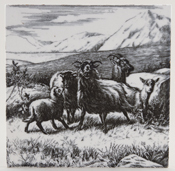 This tile features mountain sheep and is printed in black. Backstamp: Mintons China Works Stoke on Trent Mintons Stoke Upon Trent Walbrook London. A little minor pitting to the rim overall excellent condition. One of a series of tiles, designed by William Wise (1847-1889) for Minton. 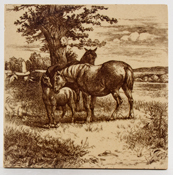 This tile features farm horses and is printed in black. Backstamp: Mintons China Works Stoke on Trent Mintons Stoke Upon Trent Walbrook London. A little pitting to the rim otherwise excellent condition. One of a series of tiles, designed by William Wise (1847-1889) for Minton. 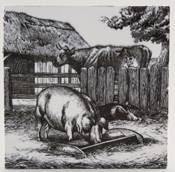 This tile features a cow and pigs and is printed in black. Backstamp: Mintons China Works Stoke on Trent Mintons Stoke Upon Trent Walbrook London. Minor pitting to the rim and a little excess cement around the side, overall excellent condition. One of a series of tiles, designed by William Wise (1847-1889) for Minton. 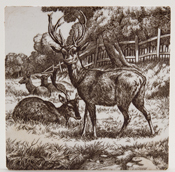 This tile features Deer in parkland and is printed in brown and the back of the tile is glazed. Backstamp: Mintons China Works Stoke on Trent Mintons Stoke Upon Trent Walbrook London No 1699. Light crazing with a little discolouration although this is mainly on the back. All corners have small chips, the surface has some scratching and on the back there is some pitting to the rim. One of a series of tiles, designed by William Wise (1847-1889) for Minton. This tile features horses. Backstamp: Mintons China Works Stoke on Trent. There is a little minor pitting and a very small chip to the side which just peeks through, overall excellent condition. 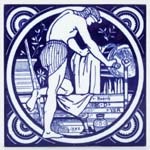 One of a series of tiles, designed by William Wise. 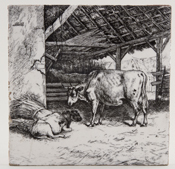 This tile features cattle, is signed on the front W Wise 1875. Backstamp: Mintons China Works Stoke on Trent. A little very minor pitting to the rim and on the side of the tile a small chip which does not show through to the front. Overall excellent condition. One of a series of tiles, designed by William Wise. This tile features sheep and a cow. Backstamp: Mintons China Works Stoke on Trent. A little very minor pitting to the rim and to the right corner a chip which just shows through. Overall excellent condition. One of a series of tiles, designed by William Wise. This tile features cattle, is signed on the front W Wise. Backstamp: Mintons China Works Stoke on Trent. A little very minor pitting to the rim, overall excellent condition. One of a series of tiles, designed by William Wise (1847-1889) for Minton. 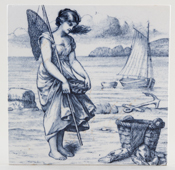 This tile features a young girl lobster catching. Backstamp: Mintons China Works Stoke on Trent Mintons Stoke Upon Trent Walbrook London. No. 2159. Crazed with a little discolouration, just a little minor pitting to the rim and around the side there are a couple of chips. One of a series of tiles, designed by William Wise (1847-1889) for Minton. 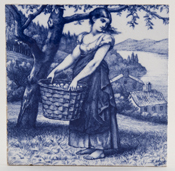 This tile features a young woman picking apples and signed on the front W Wise. Backstamp: Mintons China Works Stoke on Trent Mintons Stoke Upon Trent Walbrook London. Light all over crazing with associated light discolouration. There is pitting to the rim and around the side of the tile a couple of small chips. One of a series of tiles Designed by William Wise (1847-1889) for Minton. 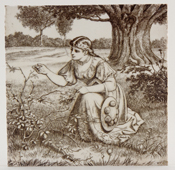 This tile features a young woman picking wild flowers and is printed in brown. Backstamp: Mintons China Works Stoke on Trent Mintons Stoke Upon Trent Walbrook London. A little minor pitting around the rim, small chip to lower right corner and a 4" hairline crack running down from top rim. One of a series of tiles Designed by William Wise (1847-1889) for Minton. 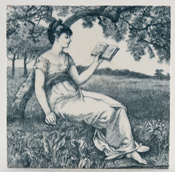 This tile features a young woman seated under a tree, reading and is printed in a subtle shade of green. Backstamp: Mintons China Works Stoke on Trent Mintons Stoke Upon Trent Walbrook London. Light all over crazing with just a hint of discolouration and a little pitting to the back rim. There are some remnants of adhesive on the back. 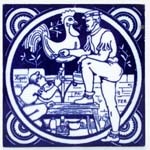 Little Tailor is one of twelve Fairy Tales tiles designed by Moyr Smith for Minton. The face of this tile is in good condition but the rim is a little nibbled especially at one corner. Snowdrop is one of twelve Fairy Tales tiles designed by Moyr Smith for Minton and this one bears his signature. The face of the tile is good but the rims are quite nibbled - particularly the lower rim. One of 12 Industrial tiles designed by Moyr Smith. Backstamp: Minton Stoke upon Trent Walbrook London Minton's China Works Stoke on Trent. Light crazing, with a manufacturing chip on the side and a few nibbles around the back rim overall excellent condition. One of 12 Industrial tiles designed by Moyr Smith. Backstamp: Minton Stoke upon Trent Walbrook London Minton's China Works Stoke on Trent. Light crazing with a little minor damage to the front rim and some rust marks at the side, overall excellent condition. One of 12 Industrial tiles designed by Moyr Smith. Backstamp: Minton Stoke upon Trent Walbrook London Minton's China Works Stoke on Trent. Light crazing and a few very minor nibbles around the outside rim overall excellent condition. 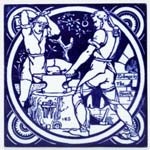 One of twelve Industrial tiles designed by Moyr Smith. Backstamp: Minton Stoke upon Trent Walbrook London Minton's China Works Stoke on Trent. Light crazing and there are a few nibbles around the outside rim overall excellent condition. One of 12 Industrial tiles designed by Moyr Smith. Backstamp: Minton Stoke upon Trent Walbrook London Minton's China Works Stoke on Trent. Light crazing and there is a small unglazed area to the right corner are a few very minor nibbles around the outside rim overall excellent condition. One of twelve Industrial tiles designed by Moyr Smith. Backstamp: Minton Stoke upon Trent Walbrook London Minton's China Works Stoke on Trent. Light crazing and there are a few very minor nibbles around the back rim overall excellent condition. One of 12 Industrial tiles designed by Moyr Smith. Backstamp: Minton Stoke upon Trent Walbrook London Minton's China Works Stoke on Trent. Light crazing and there are a few nibbles around the outside rim and a small blemish to the top left corner, overall excellent condition. There are eight different scenes in the Rustic Figures series, which was introduced about 1846/7 under factory pattern number 57. Early examples are recorded with Prosser’s Patent embossed on the back, although the series was still in production in 1885 and probably later, so dating individual tiles is difficult. The series is often attributed to William Wise, but this is incorrect and the original artist and engraver have not been identified. 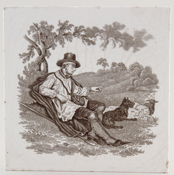 This tile features a shepherd sitting under a tree. Marked on the back Mintons China Works Stoke on Trent Made in England It has a repair to to top right corner, fairly minor pitting to the rims, crazing with some discolouration. There are eight different scenes in the Rustic Figures series, which was introduced about 1846/7 under factory pattern number 57. Early examples are recorded with Prosser’s Patent embossed on the back, although the series was still in production in 1885 and probably later, so dating individual tiles is difficult. The series is often attributed to William Wise, but this is incorrect and the original artist and engraver have not been identified. This tile features a shepherd sitting under a tree. No backstamp. It is crazed with some discolouration and there is a little minor damage to the rim. There are eight different scenes in the Rustic Figures series, which was introduced about 1846/7 under factory pattern number 57. Early examples are recorded with Prosser’s Patent embossed on the back, although the series was still in production in 1885 and probably later, so dating individual tiles is difficult. The series is often attributed to William Wise, but this is incorrect and the original artist and engraver have not been identified. Marked on the back Mintons China Works Stoke on Trent Made in England. This tile is crazed with some discolouration. It has a two small chips and a little pitting to the rim. There are eight different scenes in the Rustic Figures series, which was introduced about 1846/7 under factory pattern number 57. Early examples are recorded with Prosser’s Patent embossed on the back, although the series was still in production in 1885 and probably later, so dating individual tiles is difficult. The series is often attributed to William Wise, but this is incorrect and the original artist and engraver have not been identified. Marked on the back Mintons China Works Stoke on Trent Made in England. Light crazing with some damage to the two lower corners and a little minor pitting. There are eight different scenes in the Rustic Figures series, which was introduced about 1846/7 under factory pattern number 57. Early examples are recorded with Prosser’s Patent embossed on the back, although the series was still in production in 1885 and probably later, so dating individual tiles is difficult. The series is often attributed to William Wise, but this is incorrect and the original artist and engraver have not been identified. This tile is crazed with some associated discolouration. No backstamp. It has some pitting around the rim and a chip to one corner. There are eight different scenes in the Rustic Figures series, which was introduced about 1846/7 under factory pattern number 57. Early examples are recorded with Prosser’s Patent embossed on the back, although the series was still in production in 1885 and probably later, so dating individual tiles is difficult. The series is often attributed to William Wise, but this is incorrect and the original artist and engraver have not been identified. Marked on the back Mintons China Works Stoke on Trent. The glaze is crazed with some light associated discolouration and there are a few minor nicks around the rim, although overall the condition is good. There are eight different scenes in the Rustic Figures series, which was introduced about 1846/7 under factory pattern number 57. Early examples are recorded with Prosser’s Patent embossed on the back, although the series was still in production in 1885 and probably later, so dating individual tiles is difficult. The series is often attributed to William Wise, but this is incorrect and the original artist and engraver have not been identified. This tile features a young woman feeding rabbits. No backstamp. This tile has a chip out of one side which just shows through to the front, a little wear around the rim and a "graze" on the young ladies left arm, otherwise the face is in remarkably good condition. There are eight different scenes in the Rustic Figures series, which was introduced about 1846/7 under factory pattern number 57. 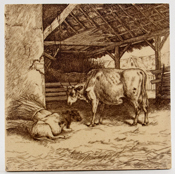 Early examples are recorded with Prosser’s Patent embossed on the back, although the series was still in production in 1885 and probably later, so dating individual tiles is difficult. The series is often attributed to William Wise, but this is incorrect and the original artist and engraver have not been identified. This tile features two young women harvesting. No backstamp. It has a little minor pitting around the rim otherwise really good condition. There are eight different scenes in the Rustic Figures series, which was introduced about 1846/7 under factory pattern number 57. Early examples are recorded with Prosser’s Patent embossed on the back, although the series was still in production in 1885 and probably later, so dating individual tiles is difficult. The series is often attributed to William Wise, but this is incorrect and the original artist and engraver have not been identified. 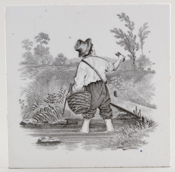 This tile features a young man with basket standing in a stream. Marked on the back Mintons China Works Stoke on Trent Made in England. Light crazing with a little minor pitting but overall is in excellent condition. There are eight different scenes in the Rustic Figures series, which was introduced about 1846/7 under factory pattern number 57. Early examples are recorded with Prosser’s Patent embossed on the back, although the series was still in production in 1885 and probably later, so dating individual tiles is difficult. The series is often attributed to William Wise, but this is incorrect and the original artist and engraver have not been identified. Marked on the back Mintons China Works Stoke on Trent Made in England. This tile has some light crazing which is just a little discoloured and just a touch of pitting around the rim but overall really good. There are eight different scenes in the Rustic Figures series, which was introduced about 1846/7 under factory pattern number 57. Early examples are recorded with Prosser’s Patent embossed on the back, although the series was still in production in 1885 and probably later, so dating individual tiles is difficult. The series is often attributed to William Wise, but this is incorrect and the original artist and engraver have not been identified. This tile features a boy and girl with a puppy. No backstamp. It is pitted around the rim but the face is good and clean. There are eight different scenes in the Rustic Figures series, which was introduced about 1846/7 under factory pattern number 57. Early examples are recorded with Prosser’s Patent embossed on the back, although the series was still in production in 1885 and probably later, so dating individual tiles is difficult. The series is often attributed to William Wise, but this is incorrect and the original artist and engraver have not been identified. This tile features a young woman crossing a steam on stepping stones. Marked on the back Mintons China Works Stoke on Trent Made in England. Crazed with some pitting around the rim but overall good. There are eight different scenes in the Rustic Figures series, which was introduced about 1846/7 under factory pattern number 57. Early examples are recorded with Prosser’s Patent embossed on the back, although the series was still in production in 1885 and probably later, so dating individual tiles is difficult. The series is often attributed to William Wise, but this is incorrect and the original artist and engraver have not been identified. This tile features a young seated woman with two goats. No backstamp. It has a little minor damage to the rim but overall is excellent. There are eight different scenes in the Rustic Figures series, which was introduced about 1846/7 under factory pattern number 57. Early examples are recorded with Prossers Patent embossed on the back, although the series was still in production in 1885 and probably later, so dating individual tiles is difficult. The series is often attributed to William Wise, but this is incorrect and the original artist and engraver have not been identified. 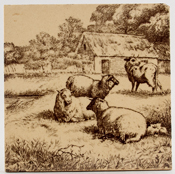 This tile features a shepherd and is printed in brown. Backstamp: Mintons China Works Stoke on Trent Mintons Stoke Upon Trent Walbrook London. Crazed with a little discolouration and around the rim, a little minor pitting and a tiny chip to one corner. The back has some remnants of green adhesive. There are eight different scenes in the Rustic Figures series, which was introduced about 1846/7 under factory pattern number 57. Early examples are recorded with Prossers Patent embossed on the back, although the series was still in production in 1885 and probably later, so dating individual tiles is difficult. The series is often attributed to William Wise, but this is incorrect and the original artist and engraver have not been identified. 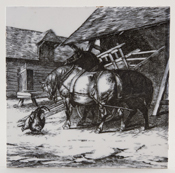 This tile features young woman collecting water with another in the background and is printed in brown. Backstamp: Mintons China Works Stoke on Trent Mintons Stoke Upon Trent Walbrook London. Crazed with a little associated discolouration. There is a small unsprung chip to the lower rim and a little minor pitting otherwise excellent. On the back there are some remnants of green adhesive. There are eight different scenes in the Rustic Figures series, which was introduced about 1846/7 under factory pattern number 57. Early examples are recorded with Prossers Patent embossed on the back, although the series was still in production in 1885 and probably later, so dating individual tiles is difficult. The series is often attributed to William Wise, but this is incorrect and the original artist and engraver have not been identified. 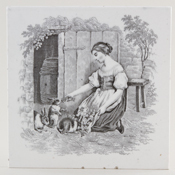 This tile features a girl feeding rabbits and is printed in grey. Backstamp: Mintons China Works Stoke on Trent Mintons Stoke Upon Trent Walbrook London. There are three tiny chips to the lower rim and minor pitting around the rest of the rim. Overall excellent condition. There are eight different scenes in the Rustic Figures series, which was introduced about 1846/7 under factory pattern number 57. Early examples are recorded with Prossers Patent embossed on the back, although the series was still in production in 1885 and probably later, so dating individual tiles is difficult. The series is often attributed to William Wise, but this is incorrect and the original artist and engraver have not been identified. 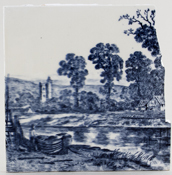 This tile features a man fishing in a stream and is printed in grey. Backstamp: Mintons China Works Stoke on Trent Mintons Stoke Upon Trent Walbrook London. A little minor pitting to the back rim overall excellent condition. Two lovely tiles printed in a slightly steely blue. Backstamp: Mintons China Works Stoke on Trent England. No 1541. One tile has some damage to top left corner and a little to the top right, elsewhere around the rim there is a little pitting. The other tile has a little damage to the rim on the right and top right corner and just a little minor pitting around the rim, overall pretty good condition for a tile! 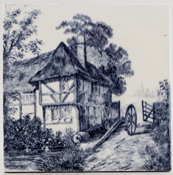 One of a series of tiles Designed by William Wise (1847-1889) for Minton. 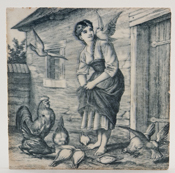 This tile features a young woman feeding doves and farmyard fowl and is printed in a subtle shade of green. Backstamp: Mintons China Works Stoke on Trent Mintons Stoke Upon Trent Walbrook London. Some surface scratching and pitting around the rim. Around the side there is a chip but this does not affect the face of the tile. One of a series of tiles, designed by William Wise (1847-1889) for Minton. 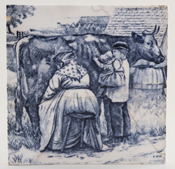 This tile features a boy holding a baby watching a woman milking a cow and printed in a steely blue. Signed on the Front W Wise. Backstamp: Mintons China Works Stoke on Trent Mintons Stoke Upon Trent Walbrook London. At some time this tile has broken into three pieces and since restuck. There is also crazing with some light discolouration, a small chip to the top right rim and around the rest of the rim a little pitting. One of a series of tiles Designed by William Wise (1847-1889) for Minton. 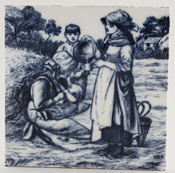 This tile features two women and children in a field and is signed on the front W Wise. Printed in a steely blue. Backstamp: Mintons China Works Stoke on Trent Mintons Stoke Upon Trent Walbrook London. There is a little pitting around the rim and a very small chip to one corner, overall excellent condition. One of a series of tiles, designed by William Wise (1847-1889) for Minton. 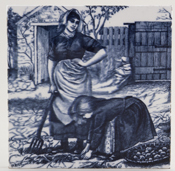 This tile features a mother and daughter harvesting potatoes and is printed in a steely blue. Signed W Wise. Backstamp: Mintons China Works Stoke on Trent Mintons Stoke Upon Trent Walbrook London. There is minor pitting to the rim and on the back a few small chips to the rim. One of a series of tiles, designed by William Wise (1847-1889) for Minton. 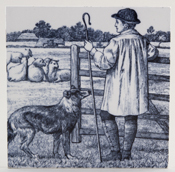 This tile features a shepherd with his dog and sheep and is printed in a steely blue. Signed on the front W Wise. Backstamp: Mintons China Works Stoke on Trent Mintons Stoke Upon Trent Walbrook London. A little very minor pitting to the rim, overall excellent condition. One of a series of tiles, designed by William Wise (1847-1889) for Minton. 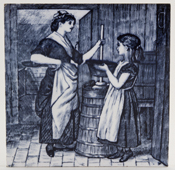 This tile features a mother and daughter doing the washing and is printed in a steely blue. Signed Wise. Backstamp: Mintons China Works Stoke on Trent Mintons Stoke Upon Trent Walbrook London. A tiny chip to one corner otherwise excellent condition. One of a series of tiles, designed by William Wise (1847-1889) for Minton. 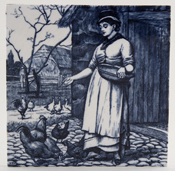 This tile features a young woman feeding chickens and is printed in a steely blue. Signed on the front W Wise. Backstamp: Mintons China Works Stoke on Trent Mintons Stoke Upon Trent Walbrook London. No 1801. Light crazing with a little minor pitting to the rim and on the back a little pitting, overall excellent condition. One of a series of tiles Designed by William Wise (1847-1889) for Minton. 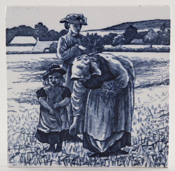 This tile features two women and a child in a field and is printed in a steely blue. Signed on the front W Wise. Backstamp: Mintons China Works Stoke on Trent Mintons Stoke Upon Trent Walbrook London. No 1801. A little very minor pitting around the rim, overall really excellent condition. One of a series of tiles, designed by William Wise (1847-1889) for Minton. 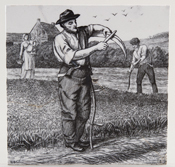 This tile features a farmer sharpening his scythe with his family in the background and is printed in black. Signed W Wise. Backstamp: Mintons China Works Stoke on Trent Mintons Stoke Upon Trent Walbrook London. Light all over crazing, at some time has been broken but now repaired. One of a series of tiles, designed by William Wise (1847-1889) for Minton. 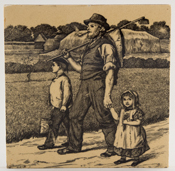 This tile features a farmer with small girl and boy and is printed in black. Signed W Wise. Backstamp: Mintons China Works Stoke on Trent Mintons Stoke Upon Trent Walbrook London. A little minor pitting to the rim and on the side there is a small chip. On the back some remnants of adhesive, overall excellent condition. From an engraving by L T Swetnam. A delightful scene of thatched cottage by a pond or river printed in a soft grey. Backstamp: Mintons China Works Stoke on Trent Made in England. Light crazing with a tiny tiny chip to top and lower left corners and the occasional very minor blemish. Overall excellent condition. From an engraving by L T Swetnam. 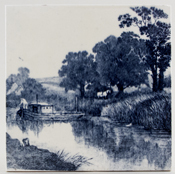 A delightful scene of a horse pulled barge on a river printed in a soft grey. Backstamp: Mintons China Works Stoke on Trent Made in England No 2475. Tiny nick to one corner and a couple of very minor chips to the side which do not affect the face, overall excellent condition. From an engraving by L T Swetnam. A delightful scene of thatched cottage with waterwheel printed in a soft hazy grey. Backstamp: Mintons China Works Stoke on Trent Made in England No 2475. You may search by any one or combination of these selections. Maker or brand: Please omit the words the, &/and, Co/Company, Son/Sons, Ltd/Limited. Pattern name: Search by Colour? To see a list of all makers and patterns in our Archive, click on one of these buttons. You can search by colour using the Pattern name box in the Search Facility above, simply type in the name of your colour. Or these links will take you to all the china patterns in your choice of colour. As you might expect much of our china is printed in blue, but we do have these other colours. A pattern printed in a base colour, with other colours added by hand or printed are grouped as Pink with Colour, Blue with Colour etc. You can search by type of item using the drop down menu in the Search Facility above or use these links to go straight to your chosen items.